As for the Plague Wing itself... That second trash pull is horrible. Those Plague Scientists constantly keep you CC'ed with Combobulating Spray and the Pustulating Horrors hit for 24k to 46k ticks with Bubbling Pus. On a positive note, the Plague Scientists can be CC'ed. I suppose if one were to solo this trash mob, you'd be best off CC'ing one of the scientists and zerging down one of the horrors before dying and finishing off the other. What I ended up doing is grouping with a retribution paladin so we could CC both scientists and hopefully kill both Horrors before they killed us. Other than that pull--the rest of the trash is quite easy. 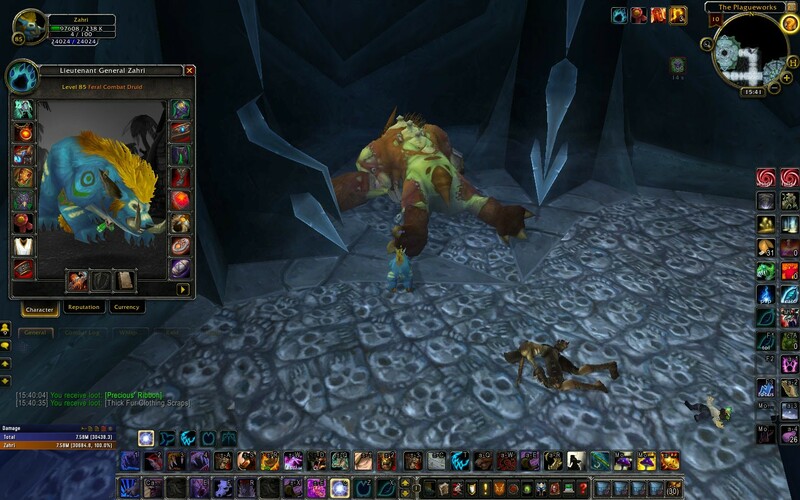 As for Precious herself... We kited her to the friendly NPCs in front of the Frost Wing and allowed Crok Scourgebane to tank Precious while my turtle pet tanked the zombies that spawned. Honestly she is not too difficult with help from the friendly NPCs. You can do that the entire ID! Kill-Wait-Kill, untill you get the Precious' Ribbon! Due to an issue, Precious' Ribbon cannot be transmogrified into another shirt; however, you can still use the skin of Precious' Ribbon to transmogrify other shirts. Our development team is investigating this.